The Cobia 220CC is a well-rounded fishing platform that will leave you feeling satisfied. The best center console fishing boats have some commonalities, like solid construction, good seakeeping abilities, and a long list of prerequisite fishing accouterments, but when you look at a boat like the Cobia 220CC you also look for something more. Truth be told there are a million and one 21- to 22-foot center consoles out there. 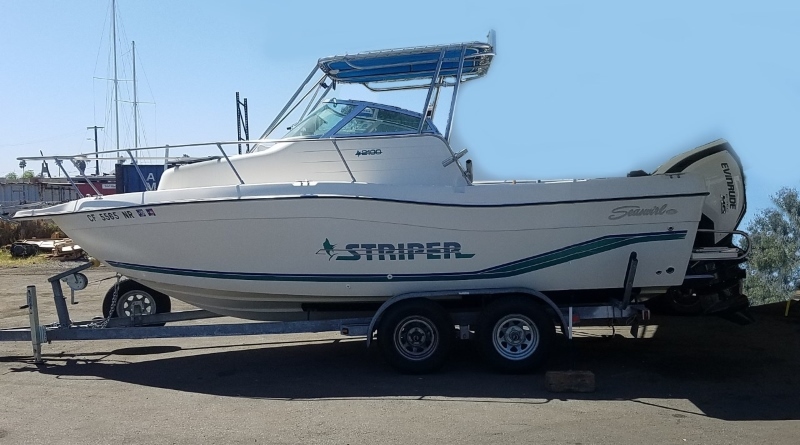 It’s a very large and competitive part of the fishing boat marketplace, and if a boat doesn’t have something special to offer, it blends right into mediocrity. In this case, that’s not a danger. The Cobia 220CCis one center console that doesn’t blend in with the crowd. 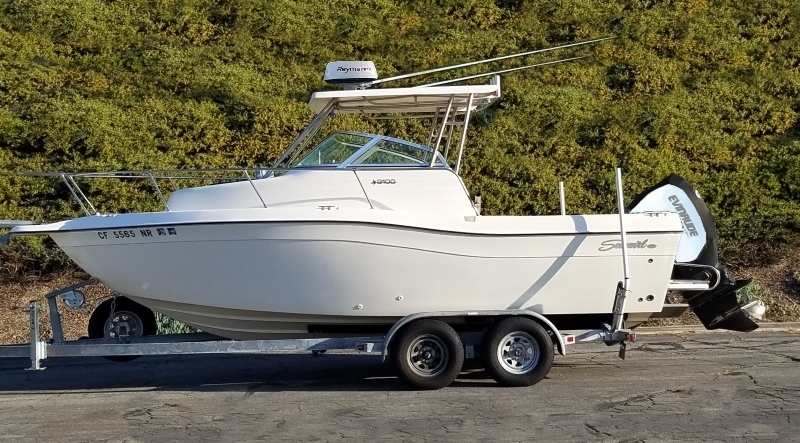 You may recall that a little over a year ago we visited Big Bay Yachts and checked out a Cobia 277CC, shortly after they began carrying the brand (see Big Bay Yachts Offers Cobia Boats to West Coast Anglers for the full story). 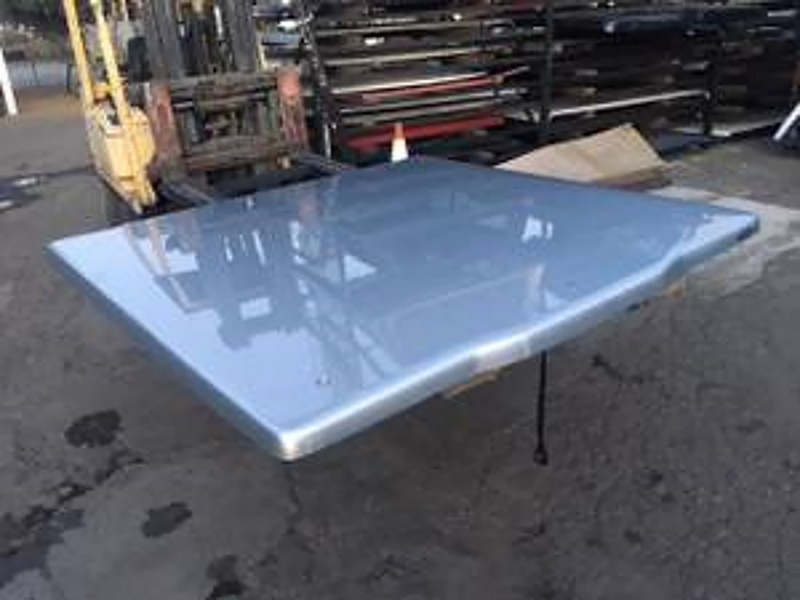 One of the items we called out was a rather exceptional hard-top. 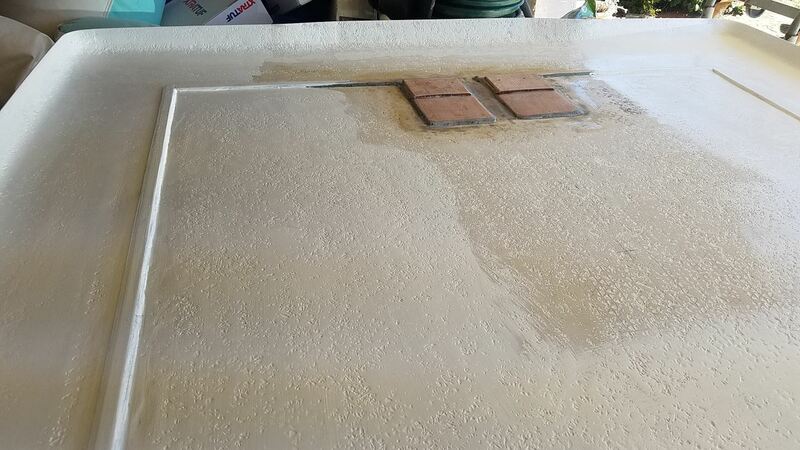 Another was the easy access to bilge rigging. And we also pointed out that the fittings and hardware were all top-shelf. Of course, the 277CC is a much larger boat, and it’s also far more expensive (the 220CC starts under $50K while the twin-engine 277CC costs more than twice as much). So, does Cobia put in the same level of effort and quality? 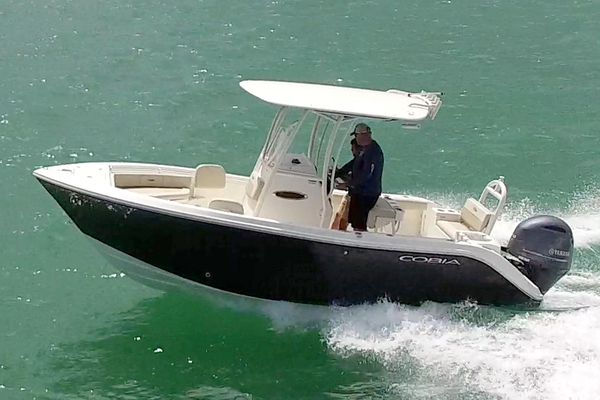 The hardtop is a premium standard feature for the Cobia. In a word, youbetcha. The hard top is a single molded piece, with an integrated electronics box, LED spreader lights, grab rails, an aft stowage box designed and vented for PFD stowage, and four rocket launchers. It stands head and shoulders above average vanilla run-of-the-mill hard tops. Same goes for the bilge access. 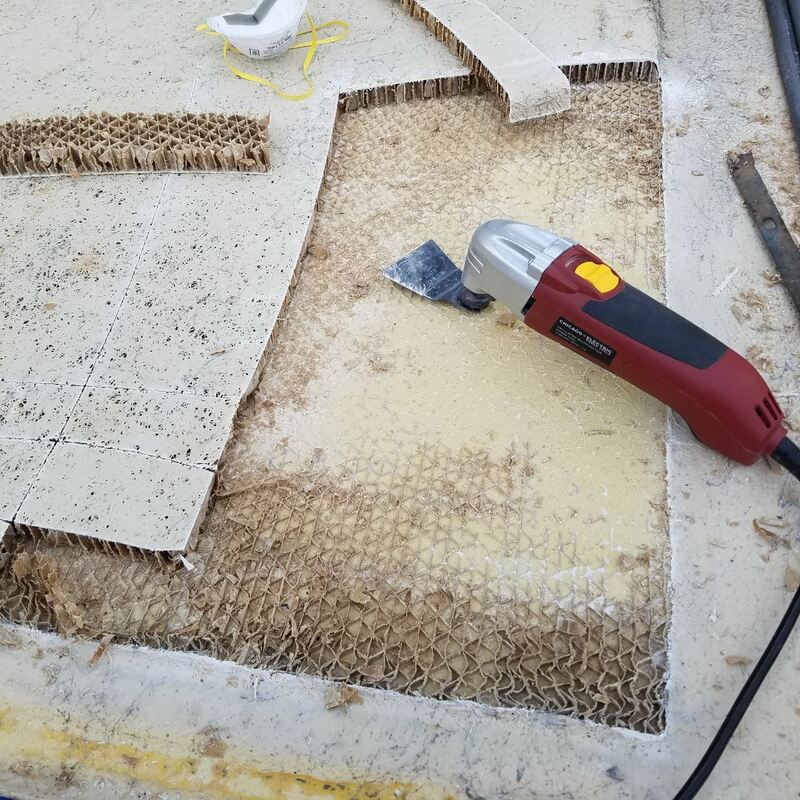 Cobia loves to design in fold-away aft bench seats that somehow fold up to open a large bilge access point, so you don’t have to skin your knuckles and contort into a pretzel every time you have to flip a seacock valve. This is true with the 220CC, too. And yes, they also maintain the use of high-end fittings and hardware. 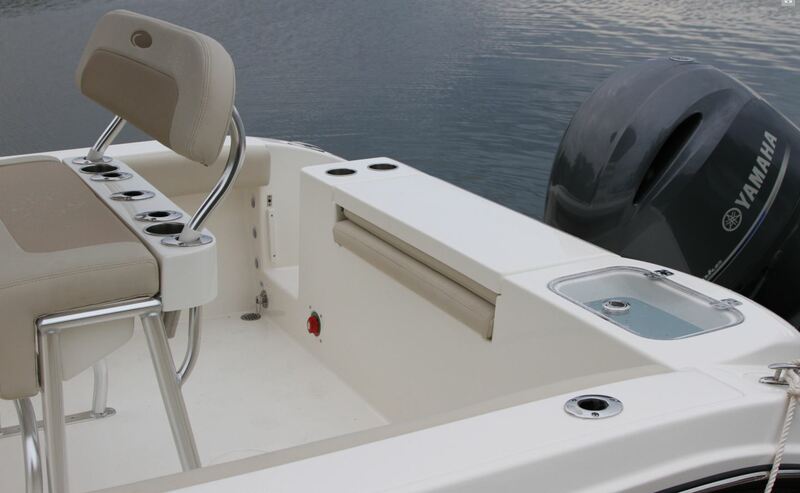 Cupholders are stainless-steel (not plastic), cleats are pull-ups (so you can collapse them and prevent snags on the fishing lines), and hinges are thoroughly beefy (just swing open that bilge access and look at the hinges on the seat base and seat back, for the proof). 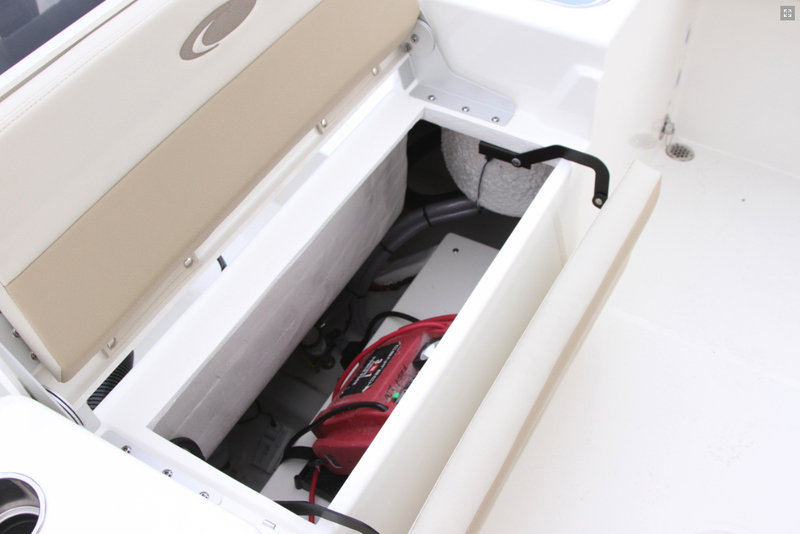 Easy bilge access is a hallmark of Cobia’s center console line, even in their smaller models. Naturally, to make the grade the boat also has to have all the prerequisite fishing goodies we know and love. 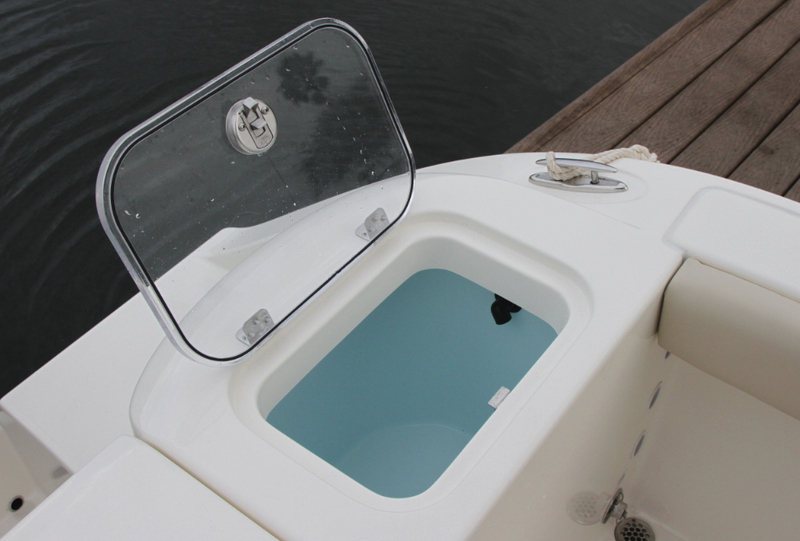 The 220CC has a 26-gallon livewell in the transom with a clear, gasketed lid; four flush gunwale-mounted rodholders; three under-gunwale rodracks on each side; and insulated fishboxes integrated into the bow seats. We do have one beef with Cobia in that they list the raw water washdown as an optional item (read: there’s an upcharge), while we believe a washdown is a no-argument-must-have on any real fishing boat. 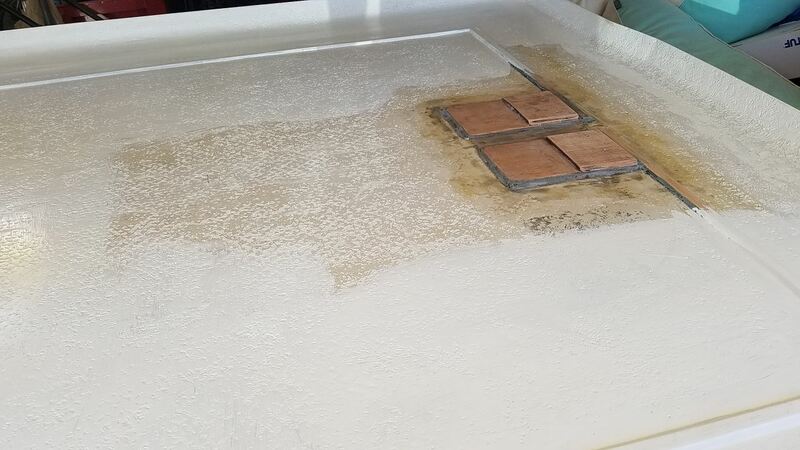 The livewell has all the right goods: an overflow drain, a baby-blue interior, no sharp corners, and a lid that closes on a gasket. 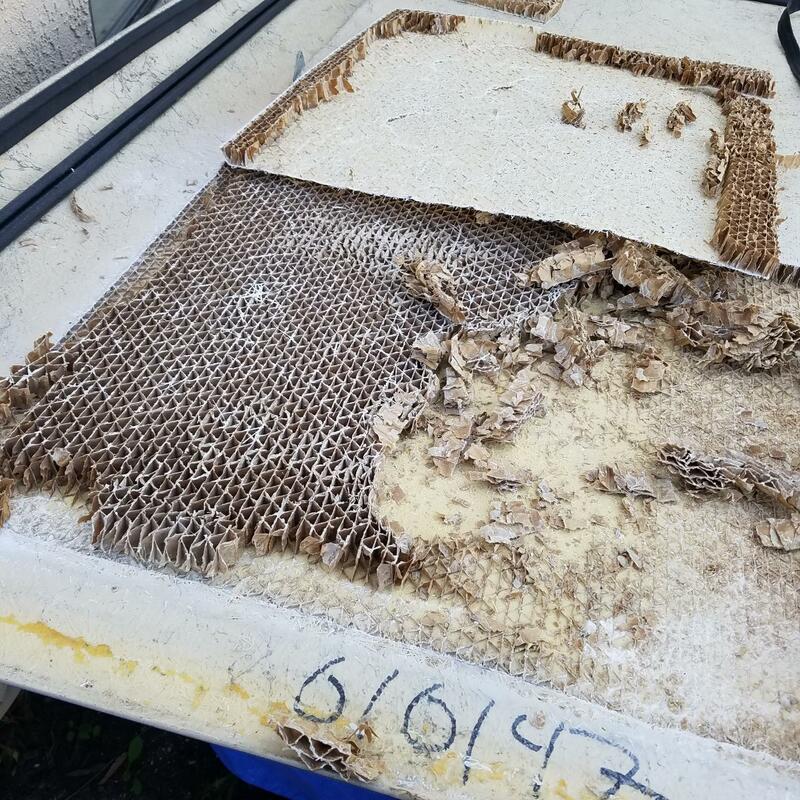 Though it’s not visible in this picture, Cobia also insulates the livewell so your baits don’t get overheated on blazing-hot days. Fuel capacity – 89 gal. We also think a lot of anglers will be happier if they upgrade the outboard, as opposed to going with the base 150. Yes, 150 horses are sufficient and get you a cruise in the mid to upper 20s, with a wide-open throttle speed a hair over 40. But if you opt for the F200, you’ll enjoy a cruise in the upper 20s to low 30s, and get up into the mid-40s at wide-open. If you’re really power-hungry, of course, you’ll up the ante several more mph across the board by getting a Yamaha V6 4.2L F250 on the transom, the maximum power for this rig. While we’re talking about possible upgrades, note that Cobia also offers some options that take the boat from stand-out to stand-alone. A set of blue underwater lights, for example, is pretty darn rare on a boat of this size (though we’d swap the blues for greens, which attract more fish). Same goes for a windlass. 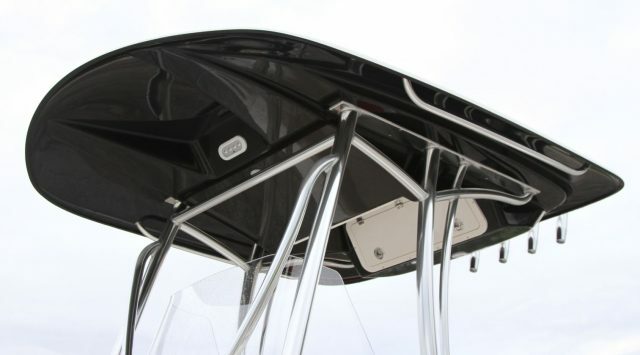 Kingfish-style rodholders can be added on the hard top, a 10-inch Garmin can be factory-installed, and you can also upgrade the standard-issue leaning post in favor of one with a built-in tackle center. 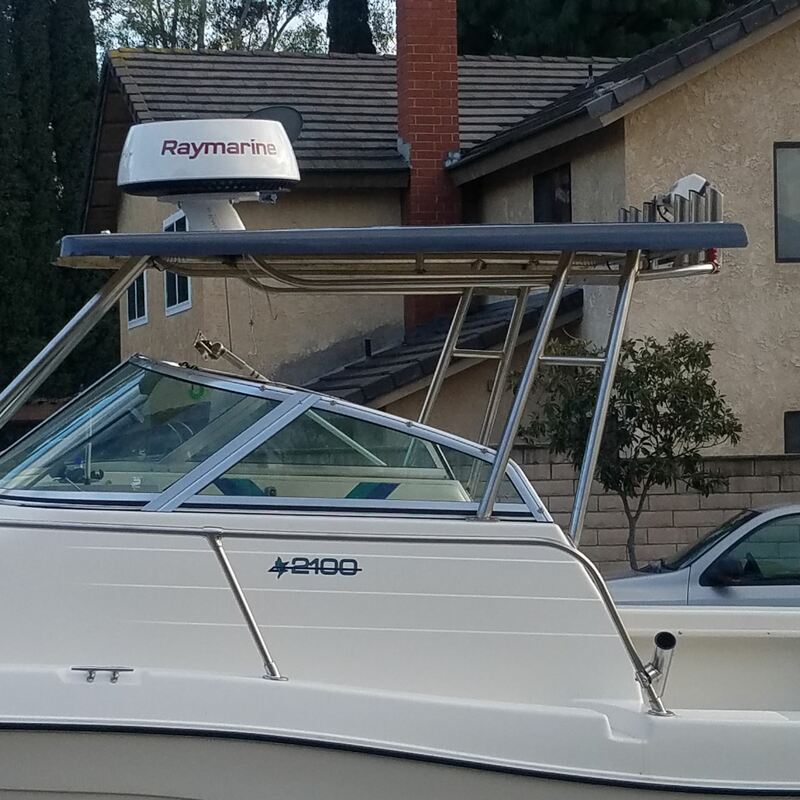 Any way you have this boat rigged, one thing’s for sure: it will not blend in with the crowd. Can you picture hauling this rig to the ramp? Yeah, we thought so. 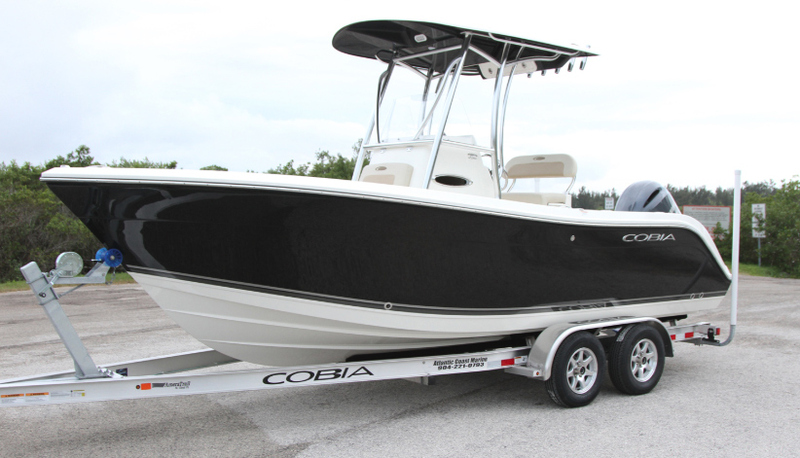 For more information, visit Cobia Boats.